The best modern tiny homes are brimming with amenities typically found in standard-sized abodes. From shape-shifting furniture to ingenious storage solutions our roundup of pint-size houses proves you can pack a lot of style and function in less than 400 square feet. Uncomfortable pieces of small furniture like padded benches posing as couches are not very inviting. That is why we love this gorgeous 300 square foot home called the Royal Pioneer by Hand Crafted Movement based in Portland, Oregon. The company designed the living room to accommodate a full-size sleeper sofa by IKEA. To make binge-watching extra cozy the room comes equipped with an electric fireplace topped off with a 40-inch Smart TV. An array of built-in wall storage create nooks for decorative accessories and books. Minimaliste Houses out of Quebec, Canada constructed this modern, rustic tiny home called The Laurier. The interior's simple, clean lines and mostly white color scheme makes the most of the modest square footage. Dark wood tones add a layer of warmth. Nearly every inch of vertical space has a purpose. For instance, the mirror on the wall unfurls into a dining table. Below it is a pint-size shelving unit. Across the room is a teensy eat-in counter with a wall-mounted TV. Above the built-in closet on the right is more storage space. Here is a custom 500 square foot Hawaiian retreat by Tiny Heirloom, a luxury teensy home building company based in Portland, Oregon. The park model styled house has a spacious central living area with a chef’s kitchen. The latter is outfitted with full-size appliances with nearly 20 feet of quartz countertops. The retractable folding ladder leads to one of the home's loft styled bedrooms. This tiny house called The Nest situated in Phoenix, Arizona is a short-term rental. It was designed and built by Wake | Floyd an architectural design firm known for creating environmentally responsible prefabricated structures. The beautiful flat-front cabinetry and the midcentury-inspired furnishings give the space a chic modernist vibe. We love how the ladder to the sleeping loft blends into the kitchen. The all-in-one washing and drying machine in the bathroom is an awesome small space amenity. Fans of modern farmhouse style have been swooning over this handcrafted home by TruForm Tiny in Reno, Nevada. Shiplap walls, a barn-style sliding door, and wide plank floors are only a few features in this home that make our hearts go pitter-pat. The 28-foot long abode comes with high ceilings, which carves out bonus square footage for an elevated bedroom big enough for a king-size mattress. On the opposite side of the house (as shown) there is a bonus space fit for a home office or den. Jewel Pearson, also known as Ms. Gypsy Soul believes tiny house living does not necessarily mean paring down to the bare basics. Her beautifully decorated little home flaunts her unique style. An elegant sofa anchors the central living area. African art adds plenty of visual interest. Notice the wall-mounted rails on the right? It is a built-in ladder for reaching the lounge styled loft. The elevated space is stocked with board games and soft furnishings. See the wee abode by Macy Miller that inspired this dwelling. The master bedroom in this 365 square foot home by Canada's Minimaliste Houses has plenty of headroom—11 feet to be exact—because it is on the main floor. Above the headboard are wall mounted shelves. Not shown in the photo is the custom-made table that slides over the bed. There is also a standard sized closet with built-in vertical storage. 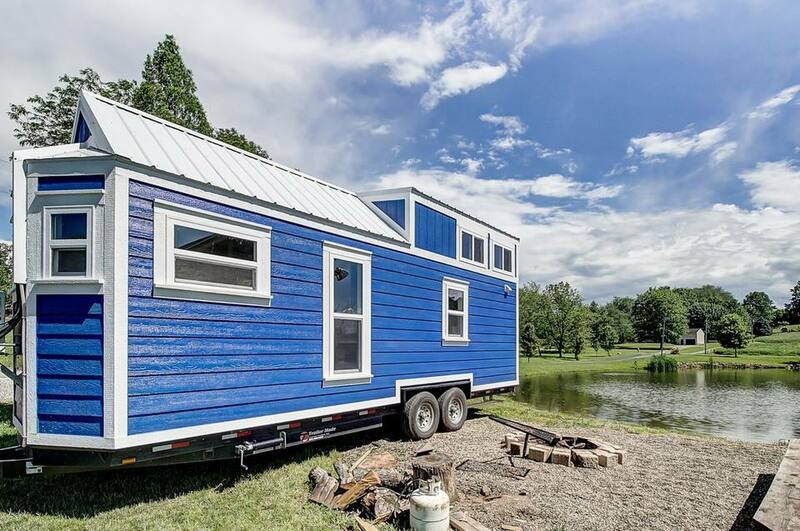 If this fun-size home called The Marion looks familiar, you may have seen it on "Tiny House Big Living" on DIY Network. The 320 square foot dwelling keeps comfort and functionality top of mind. The open-concept space comes with a gray love seat and as shown on the left a foldout upholstered bench. No awkward ladders to climb here—to get to the sleeping loft there is a staircase with concealed storage inside each step. For more details visit Tiny House Listing. Land Ark based in Marble, Colorado built this towable micro cabin that is ideal for both road trips and full-time living. The walls and ceiling in pine toe the line between rustic and modern. Another notable feature is the practical built-in eating counter that works triple duty as a desk and bonus storage space. On the right is a single wall kitchen with full-size appliances and a 32-inch stainless steel sink. A family of five lives in this renovated RV trailer by the couple behind Arrows and Bows. Tons of storage makes this tricky living situation work. Case in point, the IKEA kitchen cabinets in the modestly sized master bedroom. Built by Chris Collaris Architects, the Buitenhuis is a tiny 400 square cabin located in the woods of the Netherlands. The compact kitchen features a smart storage tip. Instead of stashing cooking essentials in cabinets, pots, pans, and a broad range of utensils are displayed on the wall. A renovated Airstream makes a mighty fine towable dwelling. Kate Oliver and Ellen Prasse, the duo behind The Modern Caravan got this one up to speed for around $60,000. Sure that seems pricey, but the money they spent added real value to the wee abode. The first order of business was addressing all the air gaps that made the RV energy inefficient. Extensive waterproofing and new windows got the job done. The 200 square foot interior got a full overhaul with bespoke built-ins. Our two favorite features are the custom velvet sofa with hidden storage and the gorgeous walnut wood kitchen cabinets designed for a perfect fit. Modern Tiny Living is the first custom tiny home building company in Columbus, Ohio. Their dwelling called The Nash is a charming 160 square foot abode chock-full of both stylish and practical touches. Dark stained wood and teal cabinetry adorn the interior. On the left is a staircase optimized with cubby storage. It leads to one of the two sleeping lofts. There is also a handrail for stair climbing safety. Black metal rails turn the nook on the right into a handy shelving unit. The small kitchen table in front folds down when not needed. A couple of architectural features elevate this home's appearance: along the bottom of the walls are attractive baseboards, and decorative molding surrounds each window. A raised kitchen instantly makes this small home called Alpha Tiny House seem extra roomy. Designed by New Frontier Tiny Homes out of Nashville, Tennessee the platform under the cooking space serves an additional purpose. It houses an easy to assemble folding dining set that sits up to eight people. The next photo reveals all. Here is another tiny dwelling by New Frontier Tiny Homes that shows the folding table and bench set assembled. When it is time to put it all away, the set comes apart. Afterward, the pieces easily slide back under the kitchen platform on the left. Another cool feature spotted in many homes by this building company are the large glass sliding doors as shown. They connect the interior to the great outdoors. Paige Morse, an interior designer, based in Dallas, Texas, transformed an old shed in her backyard into a stunning retreat. Turning the bitsy space into a 250 square foot guesthouse with two bedrooms took four months. When decorating she stuck to a mostly black and white color scheme, which made the modest abode feel more open and spacious. Morse also did not skimp on natural greenery. Houseplants strategically placed all over the home enhanced the home's relaxing vibe. A minimally designed 180 square foot home called The Millennial Tiny House by Build Tiny in New Zealand comes stuffed with space-saving tricks. A personal favorite is the black and white retractable staircase that slides into the wall shown when not needed. Under the floorboards is concealed storage. On either side of the towable dwelling are large glass sliding doors that fill the space with light during the day. Not shown in this photo is the opposite end of the abode that features a tiny loft-style home office. There is not a lot of crouching or stooping in this tiny house called the Journey by Alabama Tiny Homes. The reason? The two-tiered loft bedroom has a section that accommodates standing. The home also has a crisp white cooking space with full-size appliances. Overhead is a nice architectural touch—a coffered kitchen ceiling. This lovely teensy guest home by New Frontier Tiny Homes was custom built for German children's author Cornelia Funke. A mix of different woods and custom paint color give this charming space a unique and personal twist. Sprinkled throughout the abode are smart shelving and storage solutions that put small room corners to good use. A sliding ladder leads to the sleeping lofts. Over the bed are clerestory windows that keep the nook from feeling cramped or claustrophobic. We are particularly fond of the gray and yellow kitchen. While it lacks an oven and a few other standard appliances, it has everything needed to brew a great cup of coffee or tea. This teensy little house called The Nugget by Modern Tiny Living is a cozy cocoon built for comfort. First off the micro abode, which comes with an off-grid package that includes solar panels and propane water heater, offers 102 square feet of living space. Making it feel more comfortable than cramped is a sizable storage bed for sleeping and lounging. The pint-size kitchen is both gorgeous and functional courtesy of butcher block countertops, a copper faucet, and compact fridge. At first glance, this tiny home called the Coastal Craftsman could pass as a chic urban apartment. Designed by Hand Crafted Movement situated near Portland, Oregon, the abode's modest square footage does not sacrifice style or function. The living room's layout accommodates a sectional, sleeper sofa. The unique recess behind it combines wall storage with narrow windows. The little fireplace with cubby storage is a beautiful focal point that heats up the home in winter. Above the mantel is a wooden panel that when shut conceals the TV. On the near right is a compact desk that doubles as an entryway landing strip for bags and keys. The Nest House by Tiny House Scotland is an incredibly cozy home with winning small space solutions. Bespoke blue kitchen cabinetry whips up plenty of storage space. Overhead is a ceiling height drying rack for damp clothing. The arched doorway in the center offers up space for books and ​knickknacks. Some tiny homes are pretty inside and out. An example is this 3D printed dwelling by Emerging Objects based in Berkeley, California. While it is not equipped with a bathroom or kitchen, inside is a stylish space that functions as a backyard bonus room. But here is where things get interesting. The structure is made up of more than 4,500 ceramic tiles. The ones covering the exterior facade add a little curb appeal because they double as small succulent planters. The Roadhaus Wedge RV is the latest tiny abode by Wheelhaus in Jackson, Wyoming. Despite its 240 square feet, it feels incredible spacious because it packs a living room, kitchen, bathroom, and bedroom. There is also an outdoor deck, and for those chilly days spent indoors, there is a room warming fireplace. We are particularly fond of the windows near the ceiling. During the day they offer indoor privacy without sacrificing sunlight.